Zlatý Kopec (Golden Hill) and the valley of Zlatý potok (Golden Brook) are a favourite touristic destination. Around Zlatý Kopec, a nature park was declared in 1995. You will find here well-preserved spruce forest cover and old beech woods relics. The Nature Park is banned from motor vehicles. It is accessible only to hikers. Zlatý Kopec (Golden Hill) and the adjoining village probably acquired their names because of gold grains which were found in the area in the Middle Ages. However, far richer deposits of tin, copper and silver ores were located on both banks of Zlatý potok, and these were extensively mined here mostly in the 16th century. In the mid-19th century, zinc ores were also mined here. The mining of uranium ores dominated the post-war mining. The entrance portals of underground mines Dreikönig and Kohlreuter belong among the most obvious relics of mining on both sides of Zlatý potok and they are amongst the best preserved ones in this part of the Ore Mountains. V Near Zlatý Kopec (Golden Hill), there are two tourist border crossings that link the Czechia and Saxony. 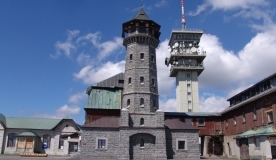 The first one is in Český Mlýn and the second one in Rozhraní. Before World War II, Zlatý Kopec belonged to nearby village Rýžovna and around 350 inhabitants lived there. Also the lonely house Český Mlýn, which lies directly on the border with Saxony, fell previously under Zlatý Kopec. At present, Zlatý Kopec and its surroundings are a popular location for hiking and biking. Around Zlatý Kopec and some biking trails.